Our third installment of The Best Organizing Books... Part 3. Come and check out more of these books that we love! Having 7 kids will certainly put you into a position to learn how to manage your daily life, especially in the life of homeschooling. 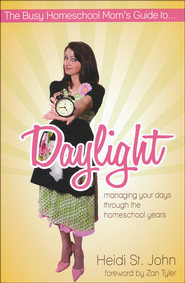 Heidi St. John in her book "The Busy Homeschool Mom's Guide to: Daylight Managing Your Days Through the Homeschool Years" daylight is a homeschooling mom's best friend. How to utilize your daytime hours so that you can have focused family evening time is the goal of this book. This book helps you take the phrase "burning daylight," and turning it into using daylight. Not just homeschooling, but St. John shows how to tackle the daily battles of home organization, meal preparation and how you can function in a life of homeschooling with freedom, fun and joy. Heidi brings a comedic aspect into her book so that the seriousness of this potentially stressful life can be put into perspective and brought to the light. Read this book if you need some fresh ideas how to live your daily life in the daylight. After all of this talk on organizing books, it's time for a change. A book that challenges the financial life of all of us. 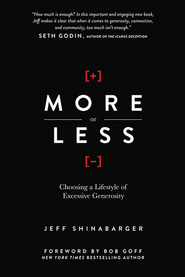 Jeff Shinabarger writes in "More or Less: Choosing a Lifestyle of Excessive Generosity," about how we must ask the question, "What is enough?" In this deeply profound book, Shinabarger dives into the questions of what would it be like to give all of our excess away and live simply. In his book, he asks this question regarding what is enough, "It all started with one idea: What would happen if we created a culture in which we gave away whatever was more than enough for us? How would our habits change if we shed the excess of money, clutter, and food in our lives? In More or Less,readers will learn how to draw a line of "enough" in their consumer choices, how to see generosity as a chance to experience freedom in a greedy world, and how to make small changes now that will help others forever. As Shinabarger reminds them, defining "enough" is more than a responsibility—it is an opportunity to give hope." As you can tell, there is depth in this study. Come and read more about what it takes to live a life of generosity that blows are general paradigms out of the water. 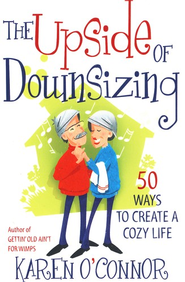 In the effort to tackle all walks of life, Karen O'Connor's book "The Upisde of Downsizing: 50 Ways to Create a Cozy Life," is a great book for those who have seen their family grow up and out of the house. O'Connor grabs on to practicals on how to simplify your life once the little birds have left the nest. In this book, she hits on how to upsize your happiness while downsizing your responsibilities. Also, how to grab hold of the zeal and excitement again in this new phase of life that you might be stepping into; rediscovering your joy in life without your children directly in the picture. As opposed to all of the other organizing books that we have reviewed, this one really hits on how to downsize your clutter, get rid of unnecessary things, making new friends and keeping old ones, and many more. If this is the stage of life you are in and wanting to know what to do or how to accomplish a more simple lifestyle, then this book is for you.